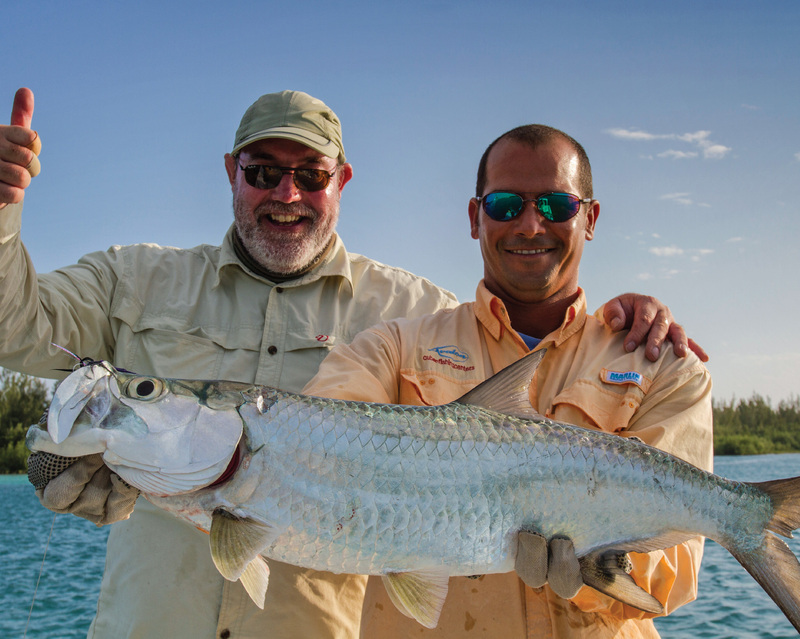 Catch tarpon, bonefish, and permit all on the same day, using the Avalon Permit Fly. DESIGNING A FLY THAT CATCHES LOTS OF FISH all over the world is not easy. Developing a pattern that has not been tied before is almost impossible. This is especially difficult because not all tiers share their creations, and there are so many people tying flies that it usually takes some time before an innovative pattern becomes widely known and accepted. Most world-renowned patterns rise to the top when they catch lots of fish, but when a particular species is especially hard to catch, anglers can go mad using the new pattern. That is exactly what happened with Mauro Ginevri’s permit fly in the waters around Cuba, and news of his incredible fly is rapidly spreading. As it turns out, the Avalon Permit Fly is a pretty cool pattern that catches fish in a variety of locations. Good catch reports are coming in from other parts of the Caribbean; this is excellent news for experienced permit fishermen and also anglers who have have failed to hook one of these trophy fish. 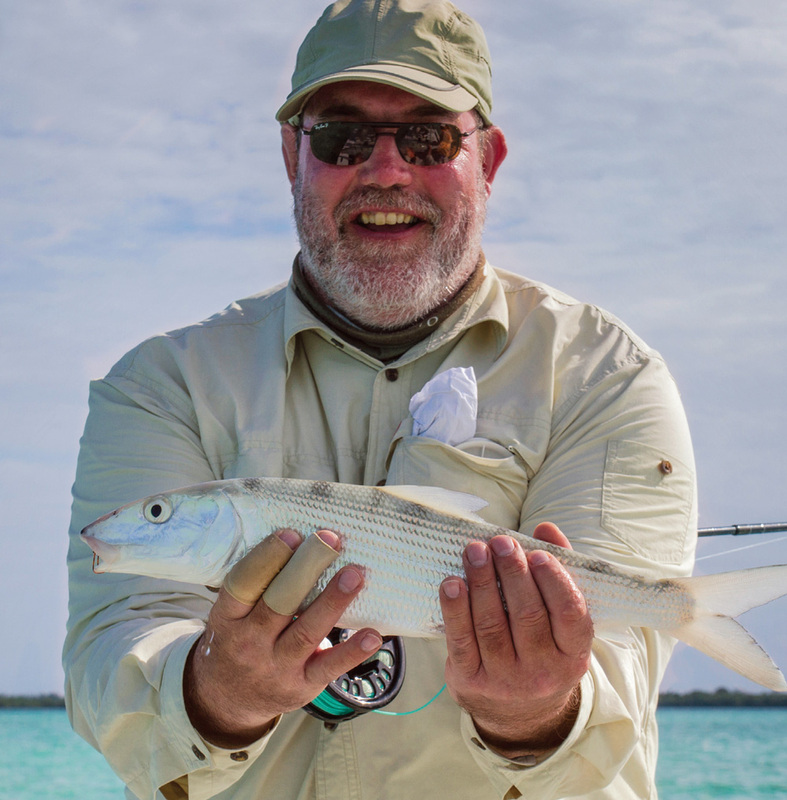 I caught my first grand slam—a permit, bonefish, and tarpon—in Cuba using the Avalon Permit Fly. Without Mauro’s pattern, I wouldn’t have caught the permit required for my grand slam. In my ignorance, I surely would have chosen a crab imitation, but why use a crab when the local permit were feeding exclusively on shrimps. And being a little more experienced, I now realize that my crabs wouldn’t have been heavy enough to succeed in the waters that I was fishing. I had several chats with Mauro about his fly in the evenings after fishing. He described his thoughts behind the pattern. We also talked a lot about the tying techniques and materials he used to develop his creation. I feel privileged to know exactly how he constructed the Avalon Permit Fly. Mauro feels very proud of this pattern, but instead of keeping the fly for himself, he is eager to share it with fellow anglers. The Avalon Permit Fly is the result of many years of intense research. Since 2000, Mauro has fished diligently for permit, using mostly crab and shrimp imitations made by the world’s most famous saltwater fly tiers. Guests to his lodge also gave Mauro many patterns, but due to the lack of success with many of these flies, he began tying his own. It was not easy for Mauro; at the time he had hardly any fly tying materials and tools. He learned his fly tying techniques by studying books and magazines that were left behind by his guests. His real tying skills started developing, however, when he took flies apart to study how they were tied. His fanaticism for fly tying increased, and today his favorite hobby is tying bonefish, permit, and tarpon flies. Mauro spent many hundreds of hours observing permit and studying their behavior. He quickly noticed how easily permit become spooked, and as a result, too nervous to catch with a fly. In other situations, Mauro discovered that permit often follow the fly during the first two or three strips through the water, and then they suddenly become alarmed and change direction. He also noticed that many of the flies that are meant to fish upside down actually roll over when stripped through the water. Permit are very clever. They know how to avoid getting hooked, and therefore we see them as extremely shy. I discovered this in Jardines de la Reina, Cuba, when the crab I was using lost one of its rubber legs. My guide told me to select another fly. I asked him if permit could count the legs on a crab. He did not answer directly, but smiled in a way that looked like he was saying yes. 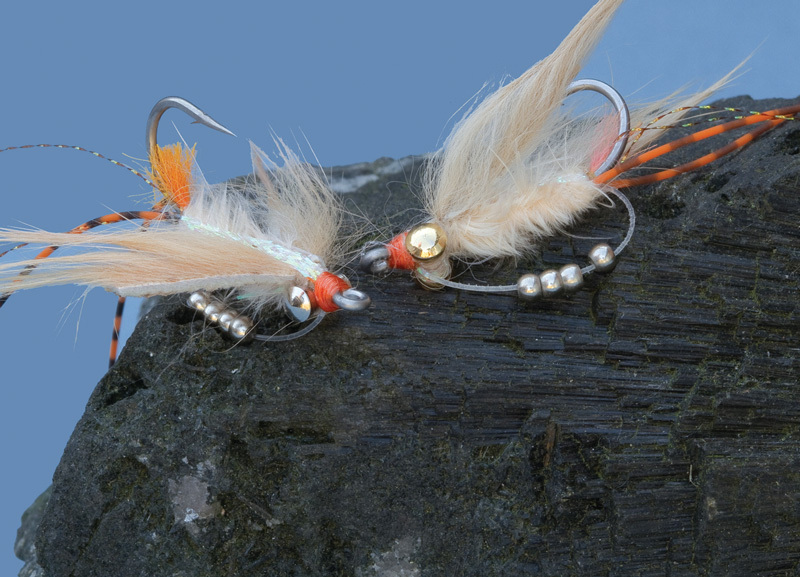 Becoming completely addicted to fly tying, Mauro wanted a pattern that would catch—not spook—permit. He also wanted to prove his permit-fishing strategies were correct. And finally, he wanted to design a fly that would work throughout the Caribbean. Mauro developed a pattern that sinks with a harmonious and elegant movement, and the hook stays on top regardless of the retrieval speed. The Avalon Permit Fly is not a crab; it is a shrimp imitation. Why did Mauro construct so long a pattern? The answer is simple. Several years ago, while researching what kind of food the local permit prefer, he concentrated on studying the flats around Cayo Largo. Snorkeling and diving were not really the best options, so he and a guide dragged for the available forage using a net. They pulled the net over distances of almost 100 meters, and on almost every sweep they discovered at least a dozen or more long, dark shrimps. Mauro realized he needed a better shrimp imitation. After several years of intense research, many prototype patterns, and still more poor catches, Mauro was close to designing his first successful permit fly. In 2007, one of his customers showed him a pattern with an attached keel system. Mauro immediately began experimenting in a completely new direction, and he started designing his first patterns with those unique keels. 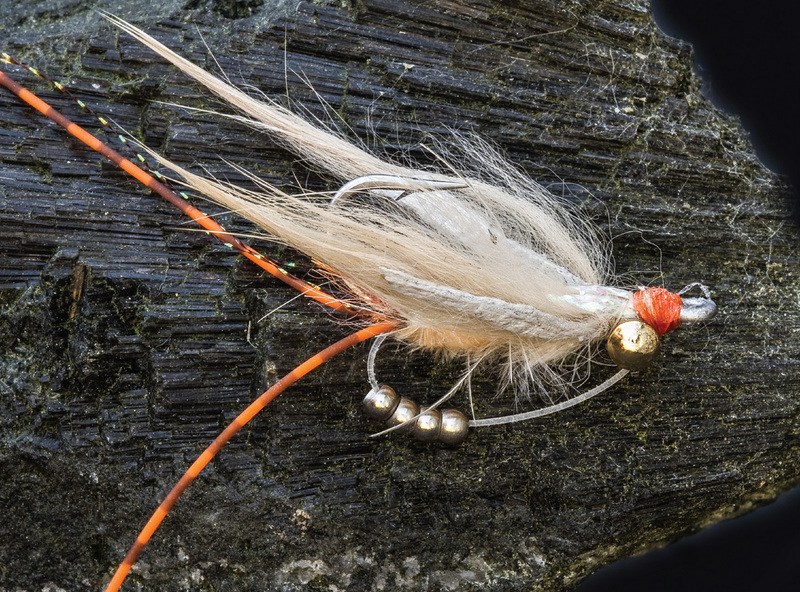 To understand the beaded keel, you must envision the fly moving in an upside-down position. Make the keel using stainless steel or silver beads and a loop of thick monofilament tied to the top of the hook shank. The beads add weight and force the hook to flip over in the water. The idea for this keel system is not entirely new. Some crab flies featuring this type of keel already existed, and I saw a similar keel system on flies in Finland in the late 1970s; those patterns were designed to catch the local pike. Proper proportions are crucial; if the size of one component is incorrect, the fly will be far less successful. At last, after many years of testing, Mauro found the perfect proportions that led to the Avalon Permit Fly’s enormous success. Creating the ideal keel was not so easy as it looks, because the monofilament must have the strength to hold four heavy beads exactly in place. Finding the best size for the loop was also a challenge. When Mauro found the correct length and position for the claws, the best thickness of monofilament and loop size for the keel, and the correct weight of beads, the fly was in perfect harmony. The beads move freely, which allows them to clang together when stripping the fly through the water. The two Zonker strips, tied in a delta-winged position, keep the fly in balance and prevents it from rolling over. Mauro keeps excellent daily catch records. His reports include air and water temperatures, as well as the numbers of tarpon that are jumped and permit lost. Since April 26, 2009, until January 22, 2013, for example, only 12 permit were caught using patterns other than the Avalon Permit Fly; with Mauro’s pattern, anglers hooked 439 permit and landed 321 of those fish. One permit escaped with the angler’s rod and reel, one fish straightened the stainless steel hook, and 116 broke leaders or shook the hooks. 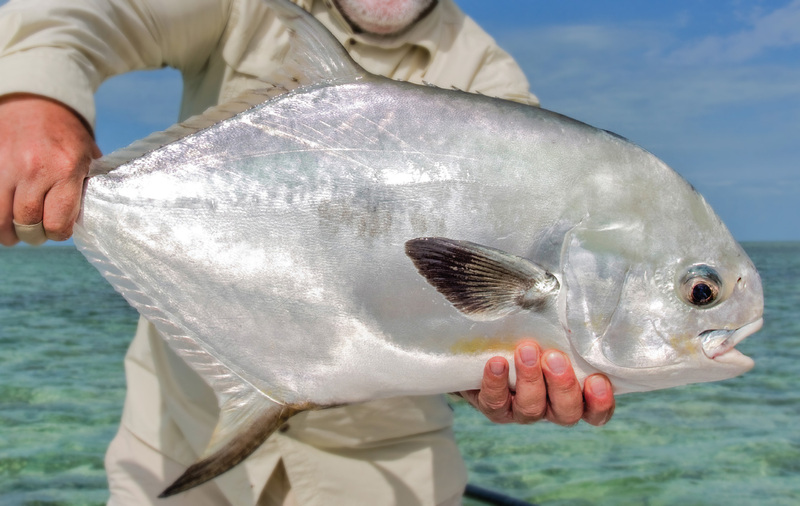 Today, anglers have caught more than 600 permit using this awesome fly at Cayo Largo alone! Using the proper proportions of materials is key to tying the Avalon Permit Fly. Here are the dimensions of the components for a size 2 fly. Mouth: 3 /8 inch long. Claws: The skin is ¾ inch long, and the overall length (to the tips of the hair) is 1½ inches long. Keel: The keel is ¾ inch long, and the monofilament loop is 3 /8 inch at the deepest position. Hook: Tiemco TMC811S, size 2. Thread for the body: Tan 6/0 (140 denier). Eyes: Silver or gold dumbbell eyes. Antennae: Black or wine-colored Krystal Flash. Legs: Grizzly barred orange, medium rubber legs. Mouth: Yellowish orange arctic fox tail fur. Claws: Two light tan or light gray, straight-cut Zonker strips. Keel: 20-pound-test hard monofilament, and four silver or stainless steel beads. Thread for the head: Fluorescent orange 3/0 (210 deneir). Hans van Klinken is one of Europe’s leading pattern designers and fly tying instructors. He is also a regular contributor to this magazine. To follow Hans and see more of his flies, go to his website, www.flyfishinggazette.com. Hans lives in Holland. Hans caught the fish in this article in the beautiful waters surrounding Cuba. If you’d like to know more about the emerging opportunities to fish in Cuba, go to cubanfishingcenters.com. Click here to receive the world's only magazine devoted exclusively to the art of tying flies for all species of fresh and saltwater game fish. 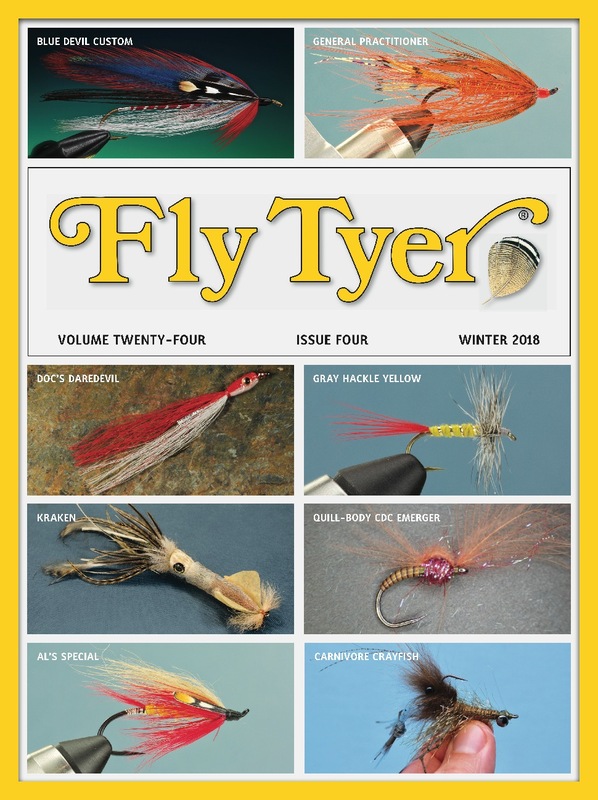 Fly Tyer offers more accurate, easy-to-follow, step-by-step tying instructions than any other publication in the marketplace. It also includes well-written articles about history and fly-tying tools, materials and new patterns. Fly Tyer is now the fourth largest fly-fishing magazine in North America. It appeals not only to novice fly tyers, but to the most experienced as well. © Copyright 2016 Fly Tyer. All rights reserved. Get more free tutorials, step-by-steps, and stories by signing up for our newsletter.